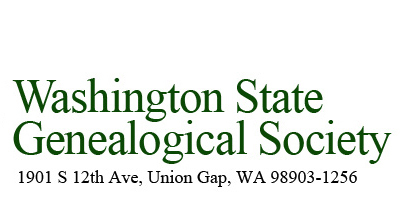 The Pioneer and First Citizen Certificate Program is an ongoing effort by the Washington State Genealogical Society. Both pioneers (those who lived in Washington on or before 11 Nov 1889) and first citizens (those who arrived in the state on or before 31 Dec 1900) are eligible for certification. Certificates will be issued to descendants of those pioneers and first citizens upon satisfactory completion of the application and approval by the WSGS Certificate Committee. Read all instructions and study the application before starting to fill it out. If you have any questions, write to the address listed below or email Info@wasgs.org. 1. Only one application, accompanied by documentation, will be accepted per envelope. 2. If you wish certificates for more than one pioneer/first citizen ancestor, make copies of the application form before filling it out. 3. You may not be able to fill in all spaces, but enough information must be completed and backed up with copies of proof to establish your direct line and residency of your pioneer. DO NOT SEND ORIGINAL DOCUMENTS -- SEND PHOTOCOPIES. 4. The fee for the first certificate for one pioneer or first citizen is $10.00. Other members of your family may obtain certificates for the same pioneer and issued in their names for $5.00 each. To qualify for this reduced rate, requests must be mailed with the first one to the same address. 5. USE MAIDEN NAMES FOR ALL WOMEN. Example: Jane Smith married John Doe. For her first marriage, she will be listed as Jane Smith. For her second marriage she will be listed as Jane (Smith) Doe. 8. SEE BELOW FOR EXAMPLES OF PROOF THAT MAY BE USED. FEDERAL OR TERRITORIAL CENSUS. Information may be hand copied IF you include date census was taken, county, household numbers and page numbers. Relationships may be shown on federal census from 1880 on. Residency will be verified in census. OFFICIAL VITAL STATISTIC RECORDS (birth, death, marriage). Birth records must have parents' names listed. The mother's maiden name must be shown if your application is through her line. OFFICIAL COURT RECORDS such as wills, estates, citizenships, divorce, voting records, guardianships, land records and litigation. Abstracts of title may include many of the foregoing vital facts that you need. Many cemetery records also provide a great deal of vital information such as family relationships. MILITARY RECORDS, SCHOOL AND CHURCH RECORDS. ANCESTOR DIARIES and OLD FAMILY BIBLES may be used in some cases. Please do not use bibles after 1910 as there are many other forms of proof after that date. More information is available in the Pioneer and First Citizen Program brochure.